This year marks the 40th anniversary of Where the Sidewalk Ends and the 50th anniversary of The Giving Tree. I fell in love with The Giving Tree when I was in college. My geology professor took our class on a field trip to a state park and he sat us all down on a gigantic rock and read The Giving Tree aloud to us. I knew then and there that if I ever had children they would have that book. When I realized that this was the 40th anniversary of Sidewalk, and that I had a copy of it that I bought used from a friend, I decided to pull it out and give it a whirl. To tell you the truth, I’ve had this one riding along in the car with me for a few months and I’ve been reading it as I wait around, dropping off or picking up teenagers. Reading this kind of stuff in the car goes a lot further than reading Dickens when you only have a few moments. 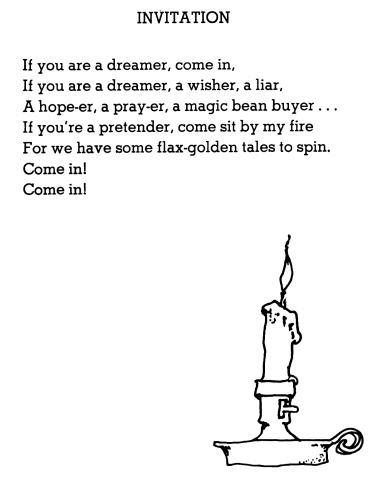 If you’ve never read any Silverstein, or if it’s been decades, I encourage you to pick some up, giggle and admire his artwork. 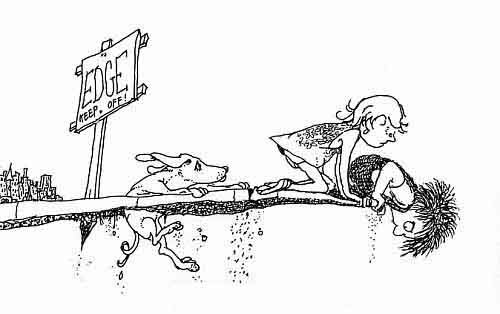 Maybe celebrate the anniversary of Where the Sidewalk Ends by reading this one. He’s the poet’s poet, when you’re in the fourth grade. I’m reading the odd poem here and there to The Girl, who’s three, she really seems to enjoy it. 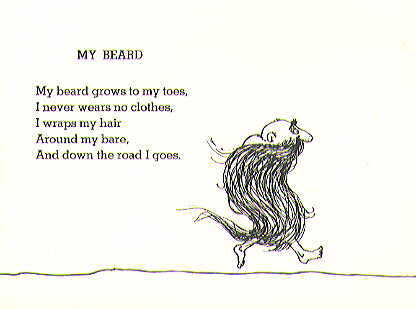 I loved this and his other poetry collection as a kid. I’ve never been enraptured by ‘The Giving Tree’ (though that is in our bedtime rotation) mostly because I find it a little disturbing. Ha ha. I know. I think I love it mostly because of the memory it evokes and also the mood. It’s so ambiguous like, I don’t know if I should say, “Oh, that’s so touching.” or “Oh, that’s so depressing…” Maybe I like it most because it provokes me to wonder how I should feel.